This chapter begins by describing the common problems associated with implementing IT business strategy that are faced by companies and other organizations, resulting in business planning that is not directly aligned with IT planning and IT investments not clearly supporting business strategies. It is stressed that all organizations should pursue strategic alignment practices to improve organizational performance when using IT-based resources. Case studies specific to the construction industry are presented to illustrate practical problems that companies face. With this background, the critical success factors of implementing IT business strategy are discussed. They mainly center around the goal of enabling businesses to reduce costs while at the same time improve IT’s contribution to their overall performance in terms of overall profit or net earnings. In the discussion, research finding of organizational success in strategic IT and business alignment are used to elaborate on the factors involved, both internal and external to the organization. Overall, the essential traits of successfully aligned organizations are mentioned. This is followed by describing a proposed model that is able to successfully address the alignment of business and IT by adopting a process-driven architecture that focuses on information management. Moving on, there are several aspects of preparing an organization for successful IT business strategy implementation. The next part describes some major steps of implementation like defining the goals and linking them to the performance criterion, focusing on the strategic intentions, adopting an effective plan, quantifying the cost and benefits of IT, measuring and tracking the results, and, last but not least, managing culture. Specifically on the construction industry, the chapter covers the main advantages and disadvantages of adopting IT to increase strategic competitiveness of construction companies. The illustrations from past research focus on links that are established between competitive advantage or project success and the use of technology. As background to proposing a set of recommendations on how IT business strategies can be implemented in design and construction firms, the case of IT adoption in the construction industry of Singapore is presented to serve as an overview of developments in this area. Based on the performance criteria established for these two types of firms in Singapore, appropriate enablers of implementation are suggested, including the kind of business strategy applicable to different firm types, through a process framework. 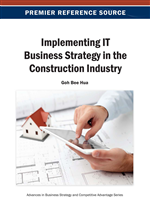 The chapter concludes with a summary of the main points covered on the implementation of IT business strategy in the construction industry. Practices of IT governance that do not direct IT from a business perspective. It is said that such ‘disconnects’ have been caused by management cultures in business and IT that are incompatible with the concept of having to apply a business perspective to manage IT mainly because business managers and IT managers hold different views about the role that IT plays in the business, the value that IT can bring, and the management practices that are needed to effectively bring IT to support business strategies. These different views result from, and in, the failure to plan, align, prioritize, innovate and measure performance of IT consistently from the perspective of a business strategy, as mentioned. Clearly from the findings of a study (Kearns and Lederer, 2000) of two types of strategic alignment—first, is the alignment of the Information Systems (IS) plan with the business plan and, second, is the alignment of the business plan with the IS plan—it was distinguished that IS managers and business managers (or senior executives) do not share the same understanding of the use of IS based resources for competitive advantage between the two types. The first type of alignment is important because it signifies IS management’s understanding of business strategy but it does not show top management commitment to IS. The second type of alignment is important because it ensures that the business plan reflects the experience and knowledge of the organization in its utilization of IS based resources and signifies better top management understanding, as well as commitment to IS. The study was based on the response of 107 IS and business managers in a survey. It was found that while many IS and business managers do share an understanding of the role of alignment of the IS plan with the business plan (i.e. the first type), they do not share an understanding of the role of alignment of the business plan with the IS plan (i.e. the second type). And, as a consequence of a lack of shared understanding between IS and business managers in the second type of strategic alignment, the organization is likely to lose significant potential benefits from IS investments because achieving strong alignment ensures optimum use of IS based resources for competitive advantage. Competitive advantage has been referred to in the study as the competencies, capabilities and resources that provide a distinct attraction to customers and create some superiority over competitors. And, in the context of utilizing IS based resources for competitive advantage, it was said it could be measured by the extent of usage of IS for such competencies as the ability to create switching costs, lower product costs, create product differentiation, enable existing business strategies and create new business strategies.